The Playback view provides access to various playback settings. The Speed slider controls the playback speed. This is often useful for playing an animation slower than normal to be sure that there are no errors that would be hard to see at a faster speed. The 0.5x, 1x, and 2x buttons are a shortcut for setting the slider to the corresponding value. The playback speed affects playback of all skeletons and animations equally. It is not saved, exported or available at runtime, though the code that applies an animation at runtime is free to use its own speed multiplier. When Stepped is enabled, a stepped transition is used between all keys. This means no interpolation (tweening) will occur between keys. This can be useful to see the keyed poses of an animation without being distracted by interpolation between keys, such as when animating using pose to pose. When Interpolated is disabled, playback is rounded to the nearest frame. This means no interpolation will occur between frames. This is a stylistic choice which makes playback less smooth, resulting in a look similar to frame by frame animation. The FPS (frames per second) slider sets the frames per second used in the dopesheet. The dopesheet splits each second of animation into frames and snaps keys to whole number frames, solely to make organizing your keys easier. While 30 FPS is a good default for most users, some animators have an intuitive sense of how many frames a certain movement will take when animating at 12 or 24 frames per second. 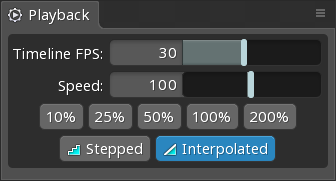 Changing the FPS can also be useful when animating fast movement. 'shift' can be held to set keys between whole number frames, but it may be more comfortable to increase the FPS to retain the benefit of snapping to whole number frames. Changing the FPS affects the speed of the animations at runtime and the setting is for the entire project. Changing the FPS does not change the frames for existing keys, so existing animations will run slower or faster. Generally the FPS should be set before animating.